Sale > Premier Menagerie Cuddle Coral Minky >.. This soft and plushy minky cuddle collection Mockingbird brings feminine touches to modern designs. 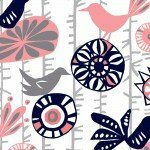 Menagerie is an abstract floral and bird design in Coral Navy Silver and Charcoal on a Snow ground.